Fuses must always be replaced with a new fuse which has the same amp rating (same colour and imprint) and size. 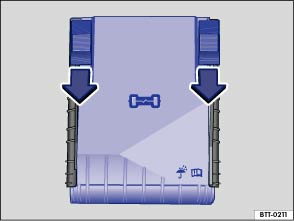 Use the handle to open the cover in the direction of the arrow . Push the plastic flap on the frame in the direction of travel (close-up). 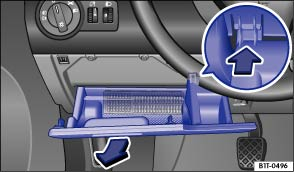 Press the release buttons to the front in the direction of the arrow to release the fuse box cover . To fit place the cover over the fuse box. Press the release buttons in the opposite direction to the arrow until they click into place. Remove the covers for the fuse boxes carefully and fit them again properly so as to avoid damage to the vehicle. Fuse boxes must be protected from dirt and moisture when opened. Dirt and moisture in the fuse boxes could cause damage to the electrical system. This chapter does not refer to all the fuses located in the vehicle. These should be changed only by a qualified workshop.